Purity of Soul is the newest essence to be made (in August 2011), and yet we feel it is certain to become one of the key essences in the range. The energetic sister to Hive of Heaven (which was made in July 2011), Purity of Soul is like a gentle purifying rain for the soul, an ablution to cleanse us of negative accumulated baggage of the ego. It also appears able to help clear negative ancestral patterns held subconsciously in the psyche and chakras. This essence is lovely, calming, gently grounding and quietening; it brings a stillness of mind, yet also attentiveness, mindfulness. The chatter of the mind is silenced. Purity of Soul would be a good essence to take before meditation, or prayer, or before any sacred ceremony; it would be especially appropriate for a bride (and the groom) to take before the wedding ceremony. 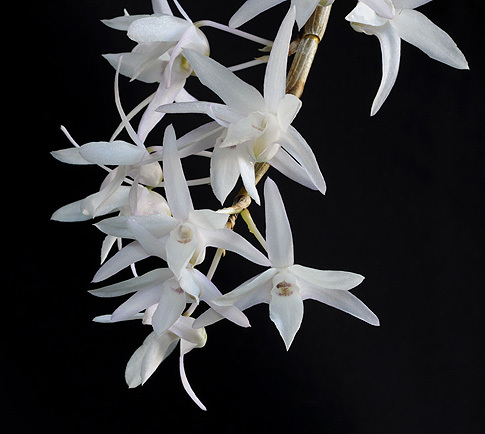 One can see this notion of “preparation for spiritual wedding” in the signature of the orchid: the nearly pure white blooms, with just a blush of pink, always appear in pairs. This August (2011) was the first time it had produced any substantial blooms since I had bought it. The blooms were so fine and beautiful, that I photographed it and emailed the photos to our colleague Adrian. A day later he called to say that we needed to make an essence with it, by daylight but without any direct sunlight falling on the plant. I duly complied, and the essence was made the following day. 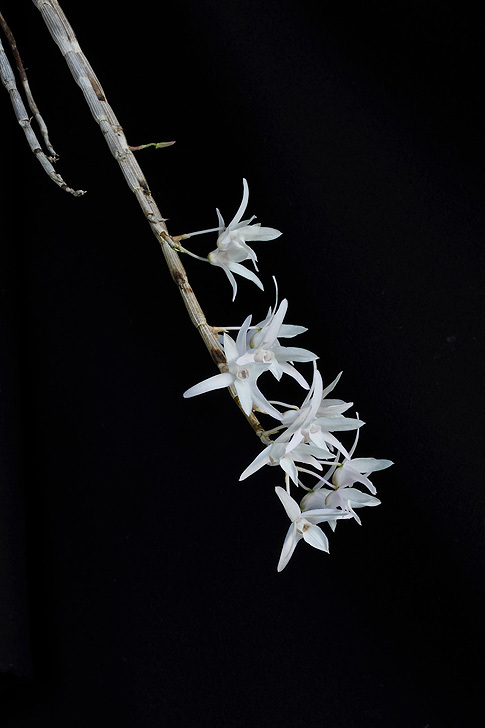 It was only after the mother tincture was bottled that I began my research to learn more about the orchid. 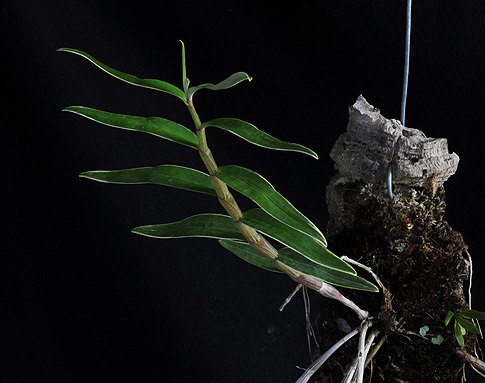 It was only at this point, 24 hours after the essence had been made, that I came to realize that this specie is one of the most important orchids in the long-established orchid-growing tradition in Japan. 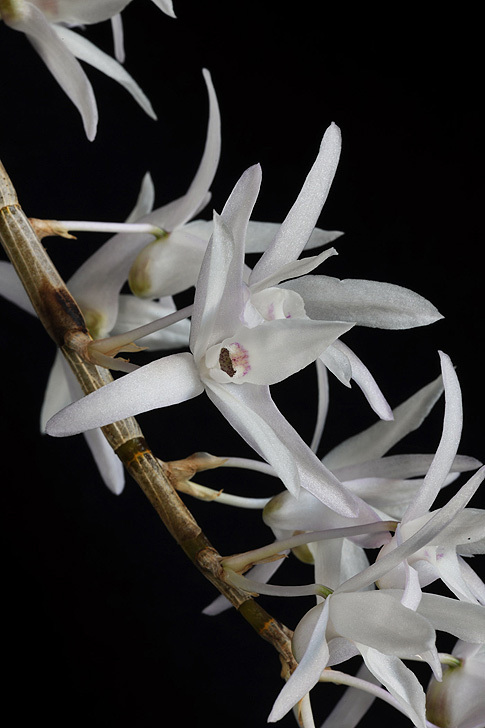 It comes as a great surprise to Western orchid enthusiasts to learn that orchids have been grown and revered in Japan for many centuries. 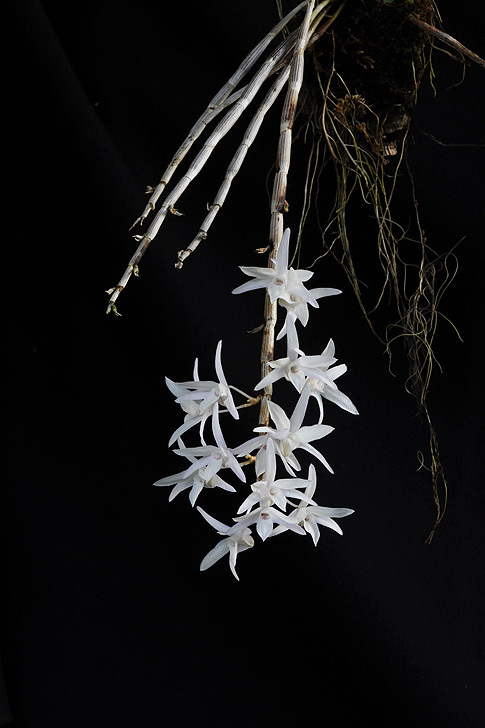 In the West our orchid-appreciation only really began in the Victorian times, in the 19th century. 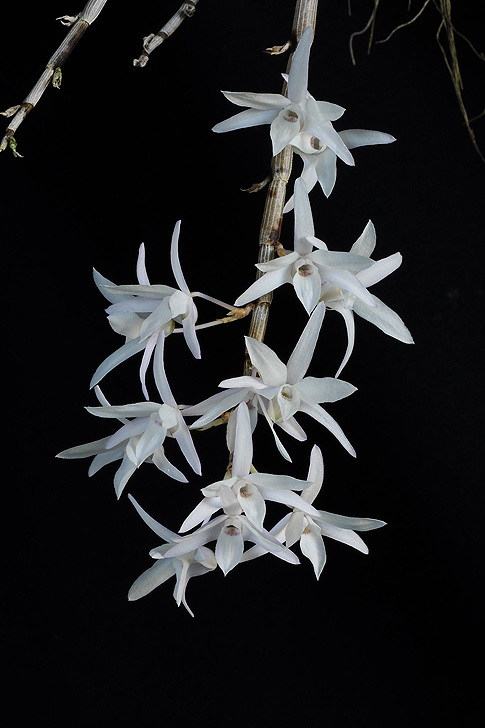 There are at a conservative estimate well over 300 commonly available varieties of Dendrobium moniliforme in Japan. Only a handful of these are seen in the West. There are different colours found in the blooms, from white to shades of pink, yellow, lavender and even one with green stripes at the edges of the blooms. But as any Japanese grower would know, there are many variations on the leaves, both in colour and form. The specimen we have has yellow edges to the green leaves, but beyond that we do not know the specific variety it would be called in Japan. 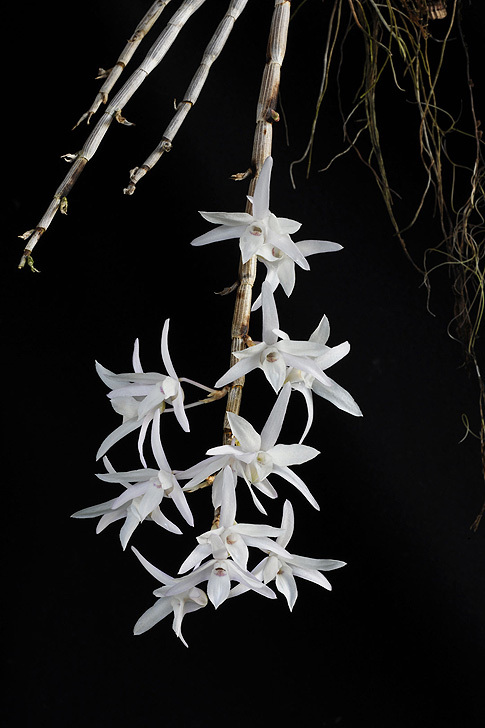 Nevertheless this plant almost certainly originated in Japan Dendrobium moniliforme is also found in China, Korea and Taiwan, as well as Japan. But it is in Japan that the growing of it has been raised to a revered art form over the centuries. This is largely due to the strong appreciation that the shogun Yoshimasa Ashikaga showed for the orchid back in the 15th century. Yoshimasa was the 8th shogun of the Ashikaga shogunate, and amongst his other activities, he grew bonzai trees. 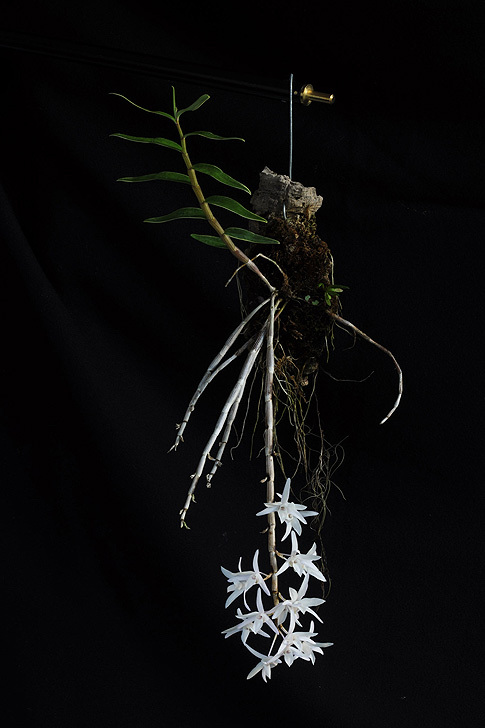 He favoured using the Dendrobium moniliforme as an adornment with his bonzai trees, as the small canes and leaves of the Sekkoku resembled small trees. He shared this idea with other powerful people of his era, and hence from that time the art of growing the plant known in Japan as Sekkoku came to be important in households of the wealthy. It was helpful (I think) to be ignorant of the great Japanese tradition surrounding this orchid, when the essence was being made. It is best to not have ideas and preconceptions in one’s mind when filling the bowl under the orchid with water, or when pouring water from the beaker over the blooms some hours later. We only want the qualities of the orchid to be in the essence. 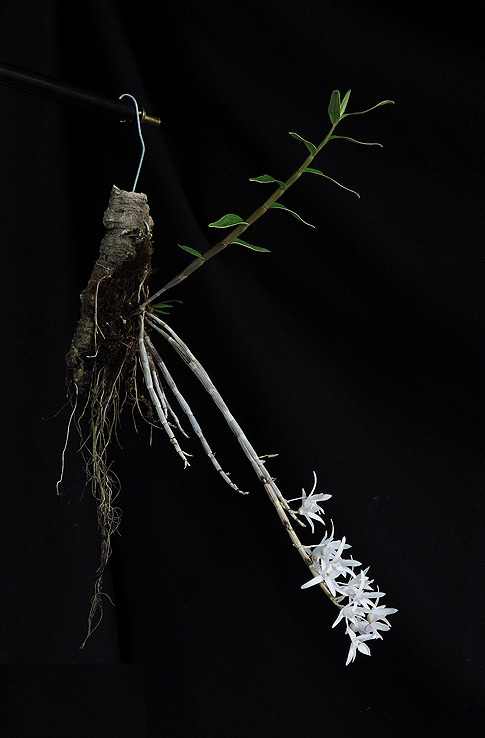 Yet it was with delight that I came to understand the significance of this orchid in relation to the orchid-growing tradition in Japan, and also found that we had just enough time to be able to include this essence in the Japanese edition of the book. I think the orchids in the greenhouse were wishing to make a gift: this essence is as it were the orchids sending a blessing upon the Japanese edition. It shows to me how much they are participating very attentively to this entire project that we are involved in with them!